The Regional Initiative for School Meals and Social Protection in the Middle East and North Africa is a partnership effort to enhance the quality and multiply the impact of school meals programmes as a crucial social protection instrument in support of most vulnerable children and communities, both in crisis and in more stable, yet vulnerable contexts. There is a growing focus in the region on the delivery of healthy meals to schoolchildren while promoting life-long healthy eating habits and stimulating local economies through local procurement. Panellists will discuss why and how governments are leading the way to better connect school meals, nutrition, education, local production, and social protection. Tunisia and Lebanon will share their experience on how integrated and innovative approaches can stimulate local agriculture and economies, while improving the nutritional and educational benefits for schoolchildren, contributing to build resilient and healthy food systems, and providing opportunities for more inclusive and sustainable development pathways. Through the Regional Initiative, partners are aligning themselves strategically to achieve greater and more sustainable impacts in support of national priorities. Existing collaboration provides an extraordinary opportunity to expand synergies and impacts through complementary actions on a regional scale, and accelerate progress towards Agenda 2030 goals. The Regional Initiative for School Meals and Social Protection in the Middle East and North Africa is a partnership effort to enhance the quality and multiply the impact of school meals programmes as a crucial social protection instrument in support of most vulnerable children and communities, both in crisis and in more stable, yet vulnerable contexts. Through the Regional Initiative, partners are aligning themselves strategically to achieve greater and more sustainable impacts in support of national priorities. Existing collaboration provides an extraordinary opportunity to expand synergies and impacts through complementary actions on a regional scale, and accelerate progress towards Agenda 2030 goals. H.E. Ambassador Amira Gornass welcomed the participants to the event; especially commending the representatives of national governments in the region for their leadership in changing lives of millions of children through policy reform and more inclusive programmes. The Ambassador highlighted that the objective of side event was to present the Initiative for School Meals and Social Protection in the Middle East and North Africa to CFS members, and to contribute to building commitments around it. The Ambassador also pointed out that School meals programmes can provide a concrete opportunity for strategic and programmatic convergence to deliver mutually reinforcing nutrition, education and social protection outcomes; while contributing to poverty reduction, community resilience and social cohesion. School meals are one of the best tools to strengthen the humanitarian-development nexus, because they naturally bridge short term and long term benefits, especially when integrated in national social protection systems, leveraging on public investments with the support of partners including donors and the private sector. Carlo Scaramella (WFP) referred to the specificity of the regional context, with the Middle East and North Africa being the only region which has seen an increase of malnutrition in the last decade. The region experiences a series of challenges vis-à-vis the attainment of SDG 2, Zero Hunger, including dependence on food imports, demographic trends, increasing poverty and malnutrition as well as unprecedented conflict-induced humanitarian crises which have caused the largest displacement and refugee crisis since World War II. Mr. Scaramella highlighted that WFP’s Programmes in multiple countries in the region are platforms for partners to converge and effectively reach the most vulnerable children. 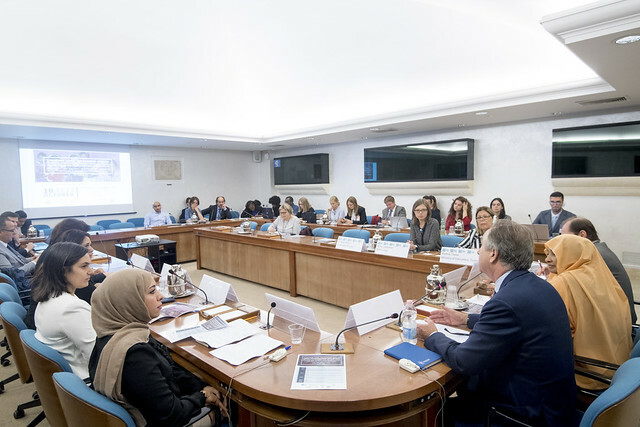 Alfredo Impiglia (FAO) outlined number of ways in which FAO, WFP and partners are successfully collaborating in the region to work towards their common goal of achieving zero hunger. The Regional Initiative for Small-Scale Family Farming is channelling FAO’s work on social protection in agriculture for the region. Together with ILO, FAO is developing a study to assess the situation of child labour, with particular focus on children in agriculture. FAO is systematically expanding their work on social protection to enhance rural livelihoods, which is complementary work to this Regional Initiative on School Meals and Social Protection, and a testament to the ongoing partnership with both WFP and government counterparts in the region; with projects on-going in Syria, Yemen, Egypt and Iraq. H.E. Ambassador Asmahan Abdulhameed Altoqi began her intervention by referring to previous cooperation with WFP, a 2013-2014 development project providing food assistance to promote girls’ education in Yemen, as a means to address the gender gap in education. Since the 2014 crisis, pressure on the education sector and the consequent risk of losing a generation of children in Yemen has increased. Underlying causes are multiple: the destruction of buildings, absenteeism of teachers, insufficient teaching material; and food insecurity which contributes to low enrolment, irregular attendance and drop out of students. The Ambassador announced that the Government of Yemen will participate in the MENA Regional School Meals and Social Protection Initiative. Within this framework, the Ministry of Education of Yemen and the World Food Programme are working to re-start the school meals program early in 2018. In conclusion, the Ambassador reminded the audience of the need to include teachers in education sector’s interventions in Yemen and beyond; and made a call to step up to the challenge to reignite education for Yemeni children, the future of the country. Ms. Hilda Khoury began by highlighting that the Syrian Crisis, now in its sixth year, has had a significant impact on Lebanon, its people, and institutions. Lebanon is the country with the highest numbers of refugees-per-capita in the world. Of the 1.5 million Syrian refugees, 500,000 are children who need to be allowed to grow to become productive members of the society. However, up to 300,000 Syrian children are out-of-school and at risk of becoming part of a lost generation. Ms. Khoury noted that there is an observed increase in proneness to violence in children, and stated that the only solution to this lies in inclusive education which fosters social acceptance and integration into schools for all children irrespective of their background. Lebanon’s Ministry of Education and Higher Education (MEHE) has opened more than 300 “second shift” schools to accommodate enrolment of Syrian children. Since many of the out-of-school Syrian children work to provide food for their families, the MEHE and partners can achieve high impact by providing school meals. This in turn can contribute to creating a spirit of collaboration, where children of all backgrounds learn, eat and play together at school. The MEHE and WFP currently run two programmes: school snacks, which reaches 18,000 children and includes nutrition education; and cash for education, in partnership with UNICEF, by which families are encouraged to send their children to school through a conditional cash transfer, targeting 50,000 children ages 5-14 in two governorates. Ms. Radhia Tayaa stated on behalf of the Minister of Education, H.E. Mr. Hatem Ben Salem, that Tunisia welcomes Initiative’s efforts to enhance collaboration among governments, commending its call for increased partnerships to advance education, nutrition and social protection outcomes. Ms. Tayaa cited the recent Strategic Review on Food Security and Nutrition, conducted by the Government of Tunisia in partnership with WFP and FAO, which affirms that well designed and well implemented social protection systems, with school meals as a key component, can effectively address the causes of food insecurity. In Tunisia, the National School Meals Programme is in a cornerstone position of the Education Sector Reform. School meals facilitate access to school, increase enrolment and attendance rates, and contribute to improving the nutritional status, health and cognitive development of children; as well as helping them build a sense of justice and belonging. Moreover, through local procurement, school meals can boost community resilience. Ms. Tayaa highlighted the importance of partnerships around school meals in Tunisia, including UN agencies such as WFP, UNICEF, ILO, the private sector – in areas such as supply chain- and the civil society. A new partnership is being launched to bring forward an integrated approach to keeping children in school, and preventing child labour in vulnerable communities. Ms Tayaa concluded by sharing Mr. Ben Salem’s view on the Initiative’s high potential, through which a long-term, multidimensional vision outlining strategic convergence for the MENA countries can bring children hope and stability, where many girls and boys live with conflict and uncertainty. Ms. Nahla Zeitoun provided remarks on the World Bank’s (WB) work in Egypt in support of macro-economic reforms, including a cash transfer programme reaching 1.9 million households, for which the Government is covering 83 percent of the cost. The WB supports embedding social protection programmes in national systems. A cash transfer conditional to school attendance is implemented in synergy with a WFP-led school feeding programme, which the Government has now made universal to Upper Egypt. The WB and WFP are partnering in Egypt to assess nutrition needs, improve monitoring and evaluation and supply chain management of the school meals programme, and by implementing the WB-led Systems Approach for Better Education Results (SABER), a tool to produce comparative data and knowledge on education policies and institutions. As Egypt goes through challenging, complicated reforms, this partnership stresses the complementarities that are at the heart of the Regional Initiative. Ms. Fatima Hachem highlighted that school feeding programmes are very important to social protection, in particular when they are linked to local production, in particular to support the livelihoods of small scale farmers. Focusing on the nutrition dimension, Ms. Hachem stressed that school meals programmes offer a great opportunity for nutrition education, to foster positive behaviours towards food, nutrition and sustainability, which can help address the challenge of bringing about lasting behavioural change. Partners must be careful, when responding to immediate needs, also to maintain longer-term perspectives in sight. Ms. Hachem referred to experiences the region including FAO’s work with women in Egypt. As a complement to FAO’s work on the “first 1000 days”, schooling provides a second opportunity to advance longer-term nutrition outcomes, by working with mothers to provide education and linking household production with school meals. In Tunisia, school meals policies have aimed to adapt menus to local cultural specificities, in particular, in accordance with the Mediterranean diet, which is proven to reduce the risk of obesity. In general, governments and partners in the MENA should implement well-planned programmes, linked to cultural preferences, to prevent obesity. Ms. Ariane Genthon, FAO Child Labour expert, highlighted that school feeding as a social protection tool can be leveraged to reduce child labour in agriculture. Mr. Impiglia added that children indeed take part of family farming in the region, which becomes a problem if it leads to them dropping out from school. Mr. Scaramella pointed to reports that when families resort to child labour as a coping strategy, in certain cases the pay for a children’s day’s work is equivalent to one meal. Governments and partners can significantly contribute to keeping children in school by providing school meals. Ms. Corinna Hawkes, from the Global Nutrition Report, referred to the importance of the nutritional content of school meals. School meals programmes in Western nations, and governments in particular, have focused a great deal on the nutritional quality of school meals. Ms. Hawkes welcomed the focus brought forward by the Initiative’s partners, regarding nutritional quality of school meals in MENA, given current nutritional concerns such as obesity. Ms. Hachem responded that the situation of school meals standards in the region is “not advanced”, but some countries do develop dietary guidelines used to align school meals, or otherwise they revert to advice from nutritionists. Luisa Cruz, from FAO’s Legal Office, asked the countries present to elaborate on the challenges and opportunities faced from a legal perspective, in particular around key issues such as food safety challenges, inter-ministerial coordination and procurement from smallholders. Ms. Maria Lukyanova, Head of WFP Tunisia, provided lessons learned from the Tunisian example, where WFP helped facilitate a Memorandum of Understanding between the ministries of Education and Agriculture. More in general, supporting the creation of platforms for different ministries to collaborate from a legal perspective, such as sectoral steering committees, constitutes good practice. Convergence of partners is key to supporting Governments to harness the multiple benefits of school meals and social protection interventions. School meals have great potential to strengthen the humanitarian-development nexus, as they bridge short term and long term benefits. The situation in Yemen points out to the need to address the gender gap in education as a paramount objective, as well as to carefully embed the protection dimension when intervening in conflict situations. Teachers should be integrated into well-designed programming reaching children and schools. The Lebanese intervention highlighted inclusive education as a means to ensuring peace and stability, reducing violence, and preserving the potential for development of children and nations. Tunisia offers a more stable, development-oriented context, where challenges such as preventing child labour persist in marginalised areas. There is great potential to engage the private sector and civil society in areas such as supply chain management. UN agencies can facilitate collaboration among ministries. The international community can support major social protection reform processes with a focus on children. Partnerships can be expanded to support enhanced national monitoring and evaluation systems. With regard to nutrition, multi-dimensional interventions should be leveraged to bring about behavioural change, tackle the double burden of malnutrition, and advance the adoption of healthy diets in the region.